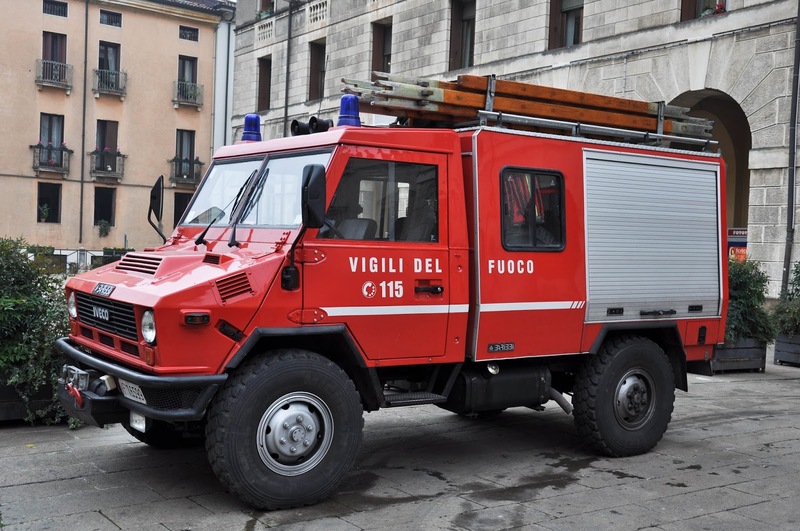 I have been eternally grateful to Italian firefighters ever since that stressful morning when we managed to lock our car keys inside our little red car (yes, stupid, I know, but there were mitigating circumstances) and three smiling firemen arrived to help us. Let me tell you! Within 30 minutes they had unlocked the car without having to break the window (which had been my biggest fear, as we were on the second day of a month-and-a-half-long journey across Europe). Whilst they were working on the car, they laughed and chatted away, never for one second making us feel bad for managing to do such a stupid, stupid thing. As it had been primarily my fault for the keys to be locked inside the car, I was really beating myself up over it, so their non-judgmental attitude was a big relief. And when one of the firemen told a story of how he and his friends had done absolutely the same thing whilst on a holiday in Croatia, I wanted to give him a hug. 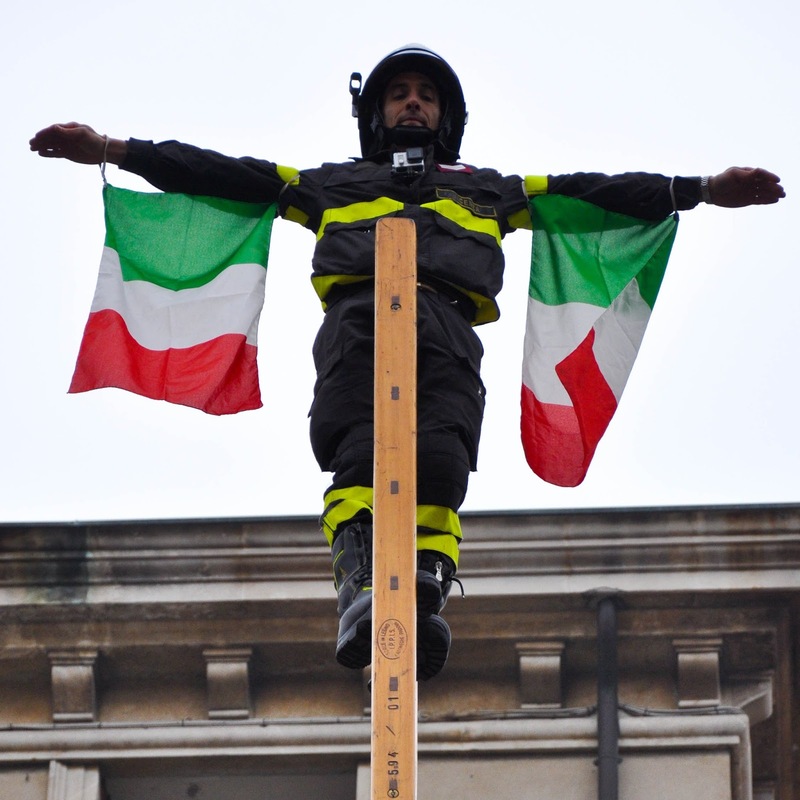 So, yeah, Italian firefighters rock! Rewind to Friday this week. I was meeting a friend right in the centre of town. 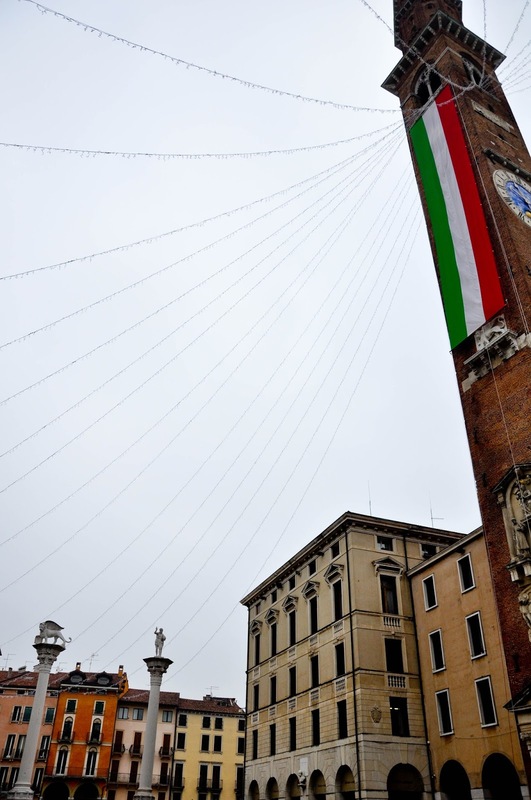 Piazza dei Signori – to be precise. 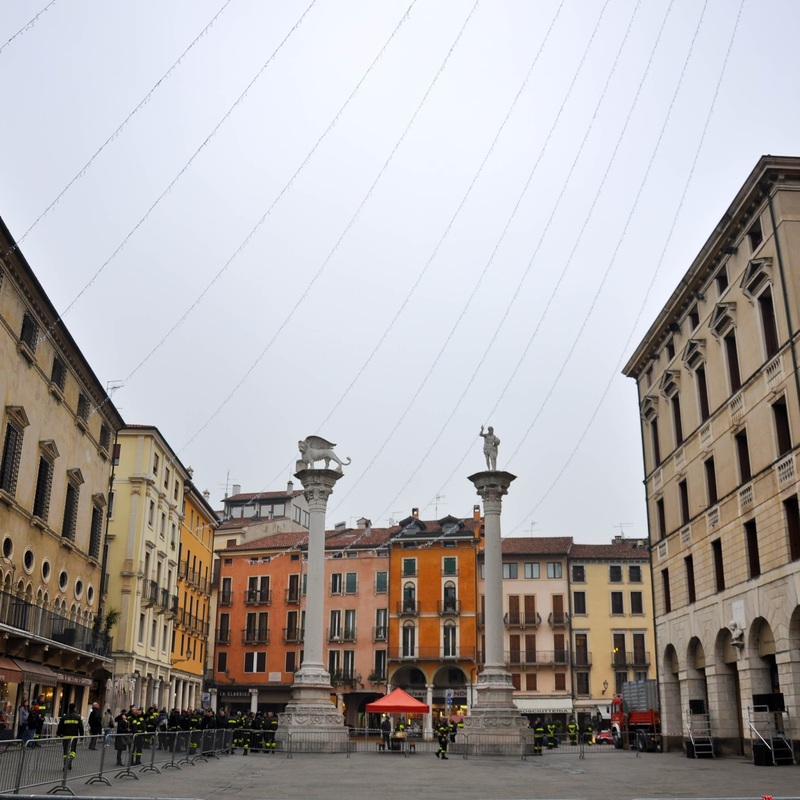 This is Vicenza’s main square with the sculptures of the Winged Lion and Jesus Christ on top of two pillars at one end and two of the most splendid buildings of the architectural genius Palladio at the other. The square looked fantastic with its Christmas lights, but it was a grey and cold morning and I was deep in thought as to which coffee house we should be heading to. I looked around trying to spot my friend from afar and, suddenly, I became aware that everywhere I looked I could see firemen. And fire engines and fire cars of any possible size and purpose. Believe it or not, there was even one for underwater rescue missions! 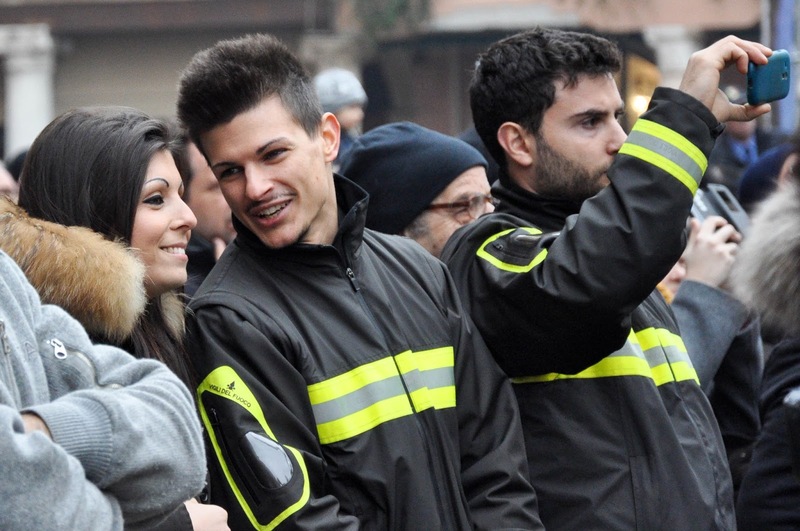 At the same time, the mood was cheerful and relaxed with the firefighters milling around and chatting animatedly. I also noticed that some of them were busy setting up a mini obstacle course. Just then my friend joined me and curious to find out what was going on, we asked in our best Italian a nearby fireman. ‘Scusi, Signore, che cosa succede?!‘. He smiled and explained that it was Santa Barbara’s Day – the Patron Saint of firefighters – so they were out to celebrate. 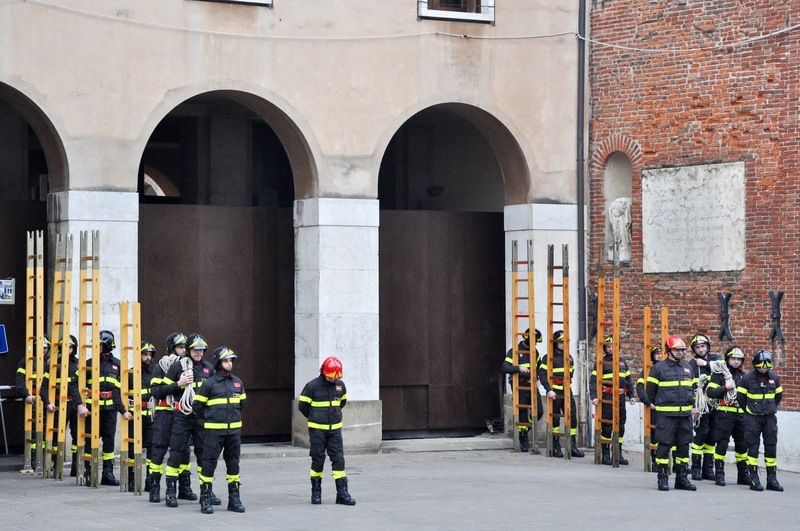 A mass was going to be held for all firemen in a nearby church which was going to be followed by a demonstration of firefighting skills and then the local kids could try their hand at being a firefighter at the mini obstacle course. We thanked the fireman, wished him a ‘Happy Firefighters’ Day!’ and retreated to a nearby cafe for a dose of caffeine and cakes. 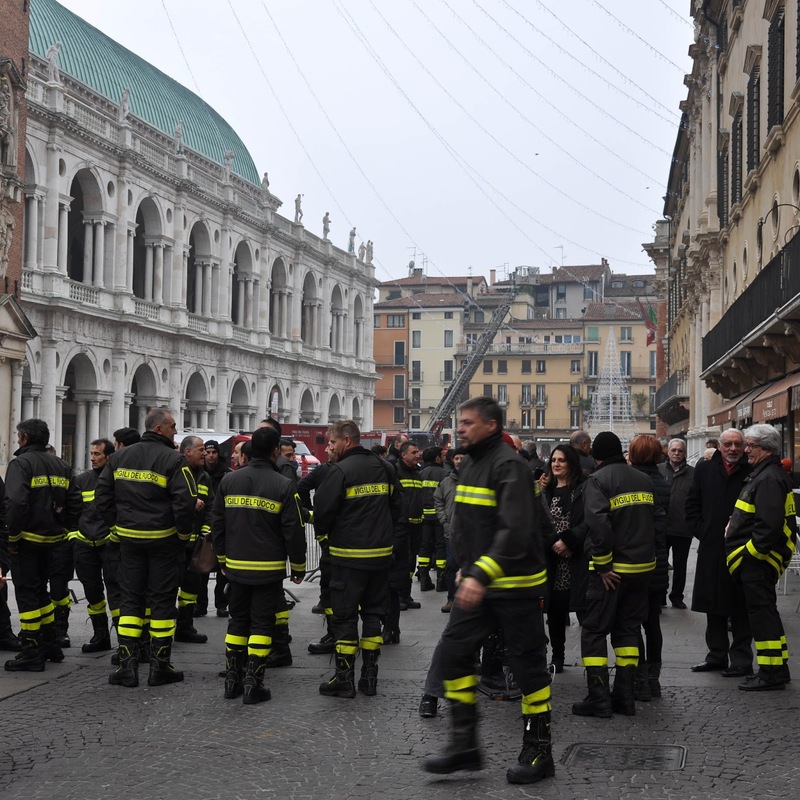 As luck would have it, just as we were finished with our catch-up and returning to the main square, the demonstration of firefighting skills was about to begin. A big crowd was stood around the barriers. 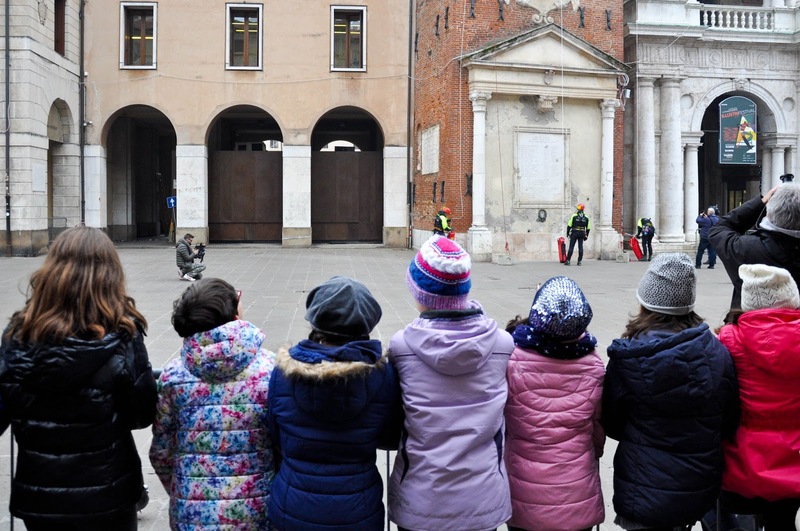 Firemen in full uniform, kids from the local schools, old and young people, it looked like half of Vicenza was there to cheer the people who keep her safe. A solemn voice then rang out over the square. 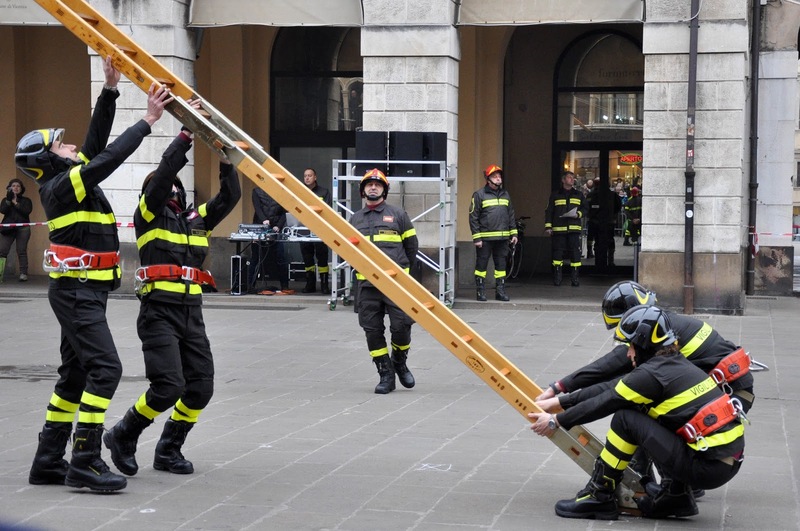 We were about to see a demonstration of the ‘scale italiane‘ – an ingenious type of ladder used by Italian firefighters. It consists of four separate pieces which slot together to form a ladder of just over ten meters length. It can be put together either on the ground and then lifted up with the help of ropes or the pieces can be slotted together one on top of another by the person who scales the ladder one piece at the time. The amazing thing about this Italian ladder is that it doesn’t need to lean against a wall in order to stay upright. Using tensed ropes, firefighters on the ground keep the ladder straight up, so that their colleagues can quickly go up and down. 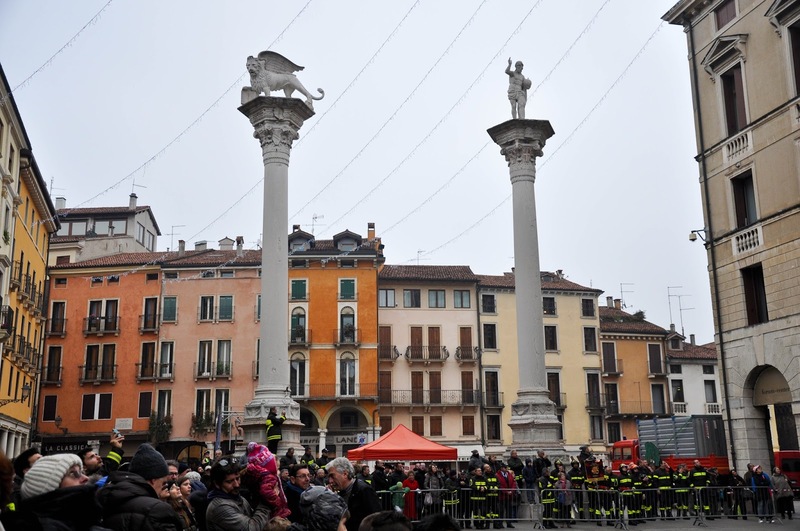 Solemn music filled the square and two groups of firefighters came into view. 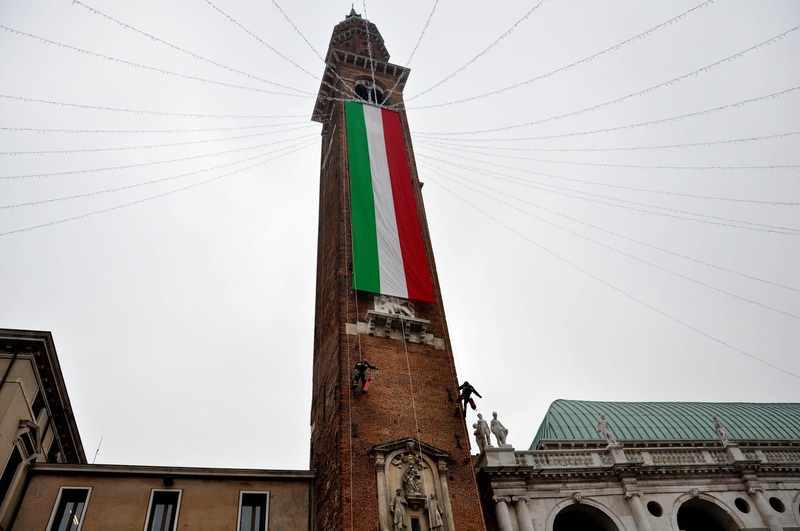 They quickly assembled together two Italian ladders, positioned them upright and secured them with tensed ropes. 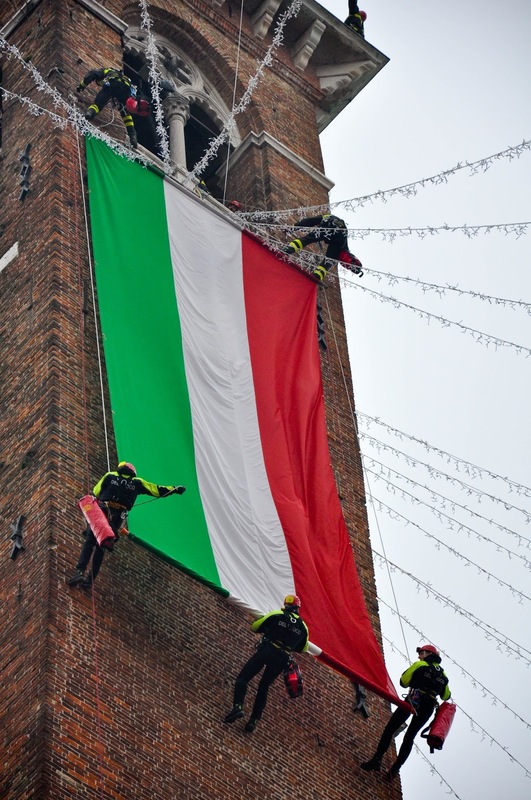 A firefighter scaled each ladder and upon reaching the top opened his arms to each of which an Italian flag had been attached. It was a tense moment of skill emphasised by the music’s beat. Enraptured, the crowd erupted in acclaim. Between taking photos and a video, I clapped too, visually understanding for the first time how difficult it must be extinguishing fires in the narrow curving streets of Italian cities and towns where every building has a centuries-spanning history and, at the same time, is tightly sandwiched between many more one-of-a-kind buildings built and painted by some of the world’s greatest artists. 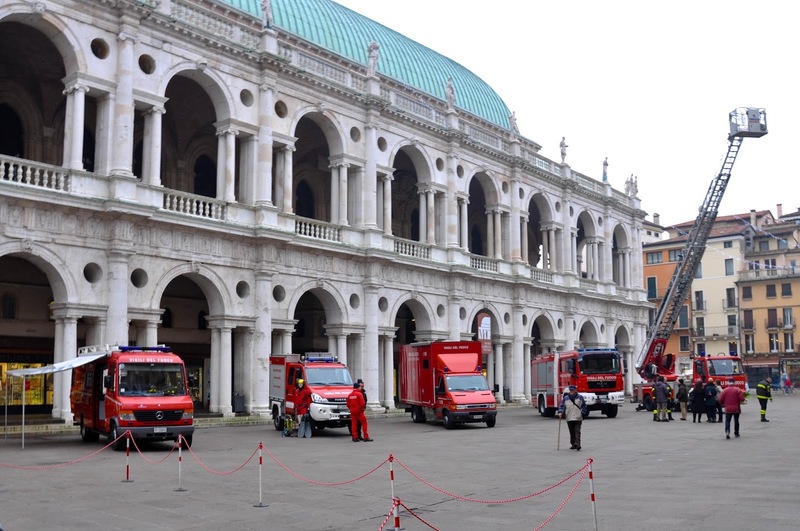 The minituarised vehicles of the Italian firefighters must help them reach tight spots on time and inventions such as the Italian ladder must give them advantage in their very hard work saving not just human lives and material property, but also irreplaceable and invaluable art. Just then the solemn voice boomed again and invited us to look up. 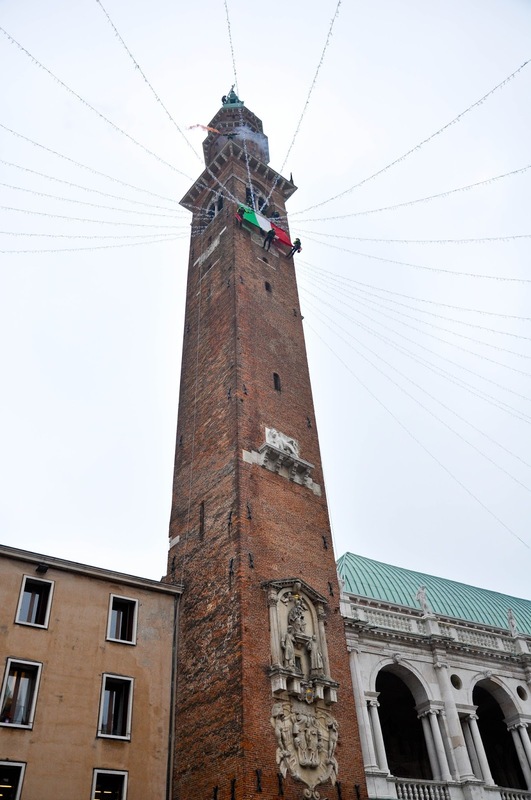 Straight in front of us and in all its 86-meter glory stood the clock-tower of Palladio’s majestic Basilica. Right on top of the clock-tower I could distinguish several people small as dots. 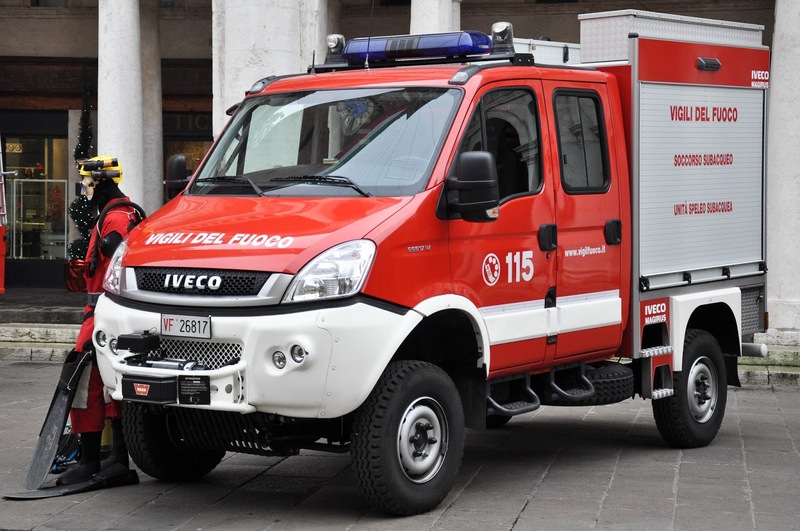 The voice announced that we were going to see firefighting techniques like the ones used during the natural disasters in Abruzzo and Emilia-Romagna. It was amazing to observe the people on top of the tower. They must have enjoyed a one-in-a-lifetime view, yet they must also have had hearts of iron, as they were attached to the incredibly high clock-tower only by means of mountaineering ropes and their skill. 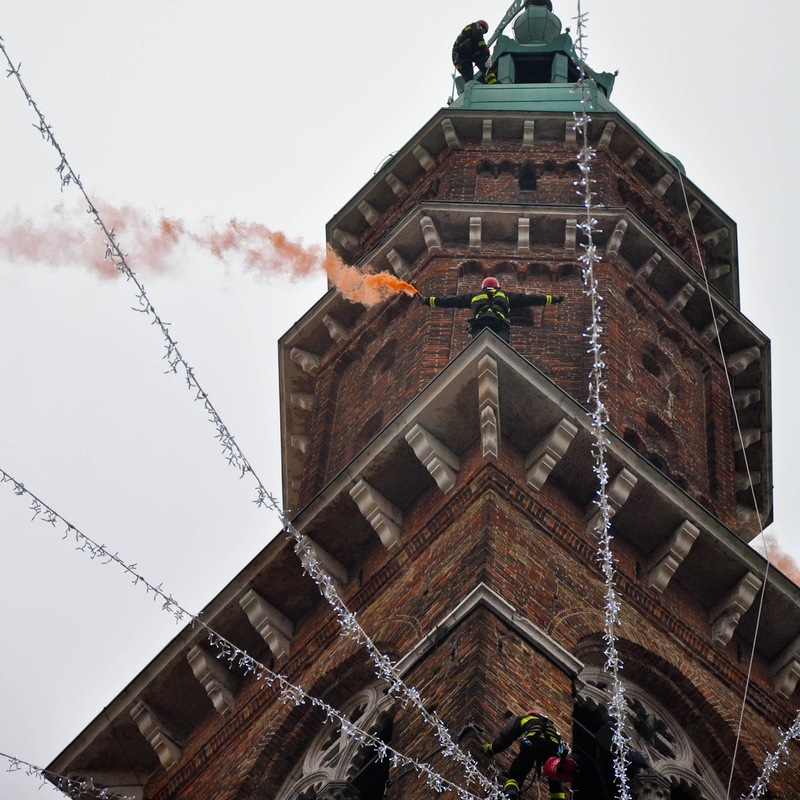 Slowly they started coming down, gliding vertically on the face of the clock-tower. 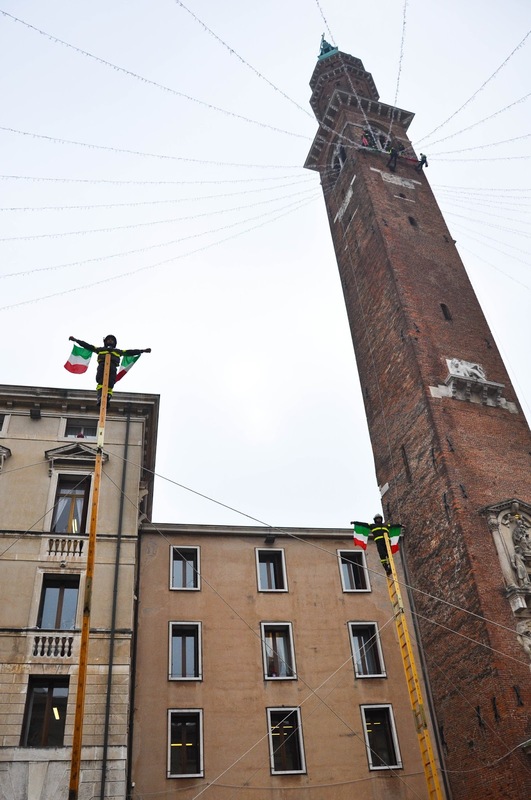 Their hands were unfurling a huge Italian flag. The crowd clapped again and again. People were taking photos and making videos. My friend nudged me and quietly showed me a lady right in front of us who all the way through the demonstration had been videoing just one of the firefighters – undoubtedly a loved one. Elsewhere, firemen had a captive audience. It was a beautiful experience! To see the firefighting profession honoured by the whole city and the fervour with which people celebrated their national identity through their flags. 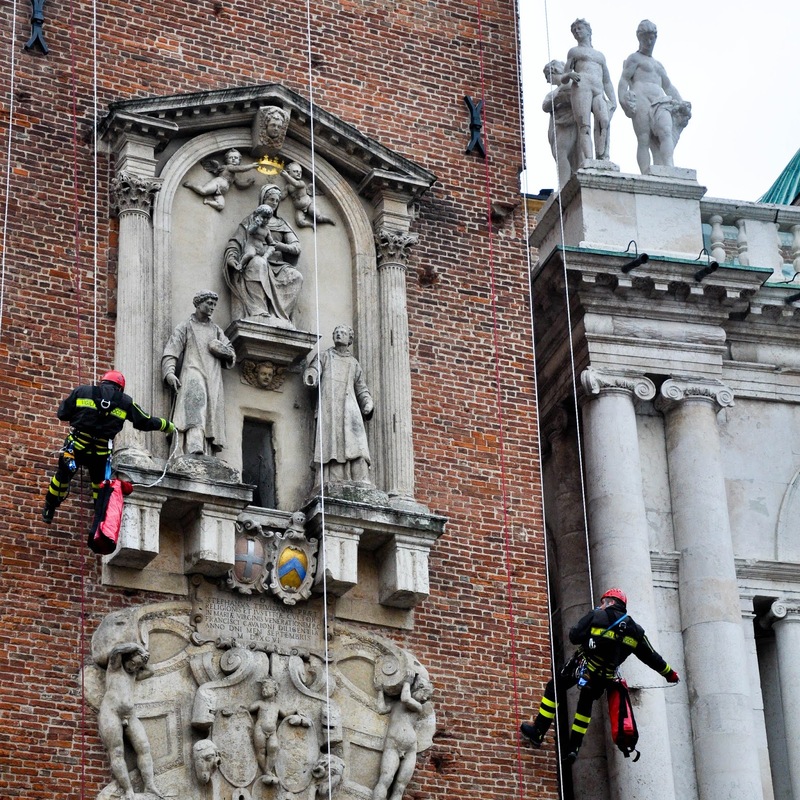 Hip, hip hooray for the Italian firefighters and their very difficult job!